Dina Kowal Creative: Happy Butterfly Day! 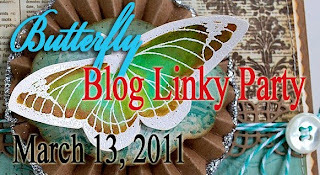 Just for the love of butterflies, some bloggers are linking up for a butterfly blog party today! We'd love to have you join us - you can find all the details and a complete list of links over at Eva's blog! I inherited my love of butterflies from my Mom - in fact this is her birthday card... and it will be a little late! (I did remember to call though...) Her birthday was on Thursday. Happy birthday, Mom! While I had everything out from the first card, I saw the newest color challenge over at CR84FN (#18 - yellow, orange, and kraft), and had to try it out as well. I used the same method on this card, except on this one I cut around a few of the wings and popped them up. Note to self: that is way easier to do before assembling the card! Remember to visit Eva's blog for all the participants' links... and if you have a butterfly project to share (or you've been inspired to make one now! ), link up and join us! Dina, these are breathtaking! Soooo pretty! Absolutely gorgeous card Dina!!! Love how you did the butterflies on the side and the sentiment is perfect!! Gorgeous images and colors! Wonderful layering of images. Your butterfly branch is gorgeous Dina!! I love the different colors you used for the butterflies...such happy colors!! Gorgeous, love the flow of the 'flies, fabulous work! Both of your cards are so beautiful! I love the 3D effect on the second one, and the colors on both are so lovely! Goodness, your cards are like magical works of art.. they are so so beautiful! Love your work! Both of these are absolutely stunning! TFS! Gorgeous, gorgeous cards, wow! The color challenge is a fabulous combination, love your new designs! OH my this is just stunningly gorgeous. I am in love with this card. WOW.. you totally rock! Dina, these are amazing. I love the colors that you used. The dimension of your butterflies is awesome. Great scriptures. Have a blessed day today! Beautiful cards, love the painting you did on them! Oh wow these are both just GORGEOUS!! Beautiful cards!! I LOVE the butterfly branch stamp! Stunning cards!!! Just love them both!!! These are both so soft and beautiful! These are so beautiful. I've never tried this technique before.